Looking for an appetizing pickled okra recipe? Check out this nifty canning idea on pickled okra complete with the basic steps, plus tips for great-tasting pickled okra! Our little patch of okra amazingly yields more than we can consume in a day and as Southerners–it’s a lot. Fried okra, okra frittata, and okra creole gumbo are just some of my family’s favorite Southern comfort food. Yet, I still have a lot more in the garden since okra is a summer annual vegetable which bears fruits all season long. Okra also matures fast and it’s a shame to let them die down with all those fruits. So I tried my Mom’s best-kept secret pickling procedure on these delicious and nutritious veggies for my family to enjoy beyond the summer. Help yourself to this detailed and fun procedure for making your own homemade pickled okra. First, as usual, wash your okra. While dirt isn’t gonna kill anyone… I still don’t want it in my pickled okra. We had roughly three weeks worth of okra to the jar, which meant some of that okra had already turned. The way you can tell if your okra should be tossed is the skin feels slightly fuzzier and the slime starts to excrete from the pod. Next, cut the tips of the pods on both ends. I like to think the spices and flavors interact with the pods more if the ends are cut open. With the ends open, the seasoning has the chance to be flavorful from the inside. Be sure to SAVE those extra bits for your chicken treats or compost pile. Our chickens devour okra and as we all know, there is absolutely no reason to waste any part of a vegetable! In a medium saucepan, add two cups of distilled white vinegar and two cups of water and turn stove to medium-high heat. Allow this mixture to heat up to a simmer before adding the next ingredients. Add 4-6 TB of granulated sugar, depending on how sweet you would like your mixture to be. The less sugar you add, the more the mixture tends to be a bit more tangy from the vinegar. SO part of this is personal preference and taste. You may also substitute with honey if you are cutting out added sugars; 3 TB of honey should do just fine. Add 2 TB of salt to the saucepan. Allow this to simmer until all of the salt and sugar have dissolved and are no longer granules. Remove the saucepan from heat once the sugar and salt have dissolved. The okra will now be more tenderized and prepped to allow for plenty of flavoring. Be sure when canning that you use Pickling Salt or Kosher Salt to avoid clouding the brine/mixture. Salt is SO important when canning. Salt is so necessary because it draws out the flavors as well as any excess water, so your fruits and veggies should be more crunchy! No one wants to have chewy okra. The crunch is half the enjoyment when eating the finalized okra! Next, wash your jars and lids. I can’t express how incredibly important this is. I once made a LOT of homemade chicken broth to freeze for the winter, and all of our jars broke in the freezer causing a HUGE mess because I did not properly sterilize the jars. Next, depending on your jar size (I used pint jars, which are roughly the height of the okra), add your pickling spice. I used about ¾ tsp per jar. You can purchase pickling spice pre-made or make your own with your choice spices! Click here to purchase pickling spice. This is definitely the step that makes my hubby LOVE my pickled okra, so if your spouse loves other spices, try experimenting! One of the best things about seasoning is that you are always allowed to make alterations and changes to fit the preferences of yourself or those who will enjoy your final product. Using your bubble remover stick, remove any excess bubbles from the hot liquid. You may have to prod the okra a bit to get the bubbles to rise. Having air pockets down in your seasoning is not ideal for canning. Screw your lids on fingertip tight and lower into the water bath. Be sure the jars are covered by one inch of water on top. Wait for the water to boil and start a 10-12 minute timer! Again these are all canning methods to help produce the most efficient and safe finalized product possible. 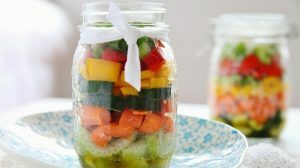 Remove the jars carefully and allow them to sit at room temperature for 24 hours. You’ll need the use of tongs or oven mitts to ensure that you do not burn yourself on the VERY hot mason jars. It’s also a good idea to place them on a towel or cookie sheet to allow to cool to room temperature naturally. Do not place warm or hot jars in the refrigerator. This is SO key. Add ¼ tsp pickle crisp to each jar. This will help give your okra a nice crunch! I’ve experimented with ⅛ tsp, which most recipes call for, and found it wasn’t quite enough. As previously stated, the crunch is one of the best parts! So don’t take chances with your okra and add a little bit more. If you want to give your okra that extra little kick, slice some jalapeños thinly and add to each jar. Fresh jalapeños are the best option. I wouldn’t recommend adding falsely hot spices. You won’t get the same kick and your okra will have a slightly more artificial flavor which won’t do! Also, don’t forget that the spicy actually derives from the seeds, so the more seeds you add the spicier the jars will be. When you’re ready to pack the okra in the jars, sort them by height. I find this helps get the most okra in each jar. For taller okra, it’s sometimes easier to tilt the jar on its side to hit every angle and be sure the okra is going straight in and not at an angle. Usually, you will still have at least a jar full on the short and small pieces of okra. Call me lazy, but tiny little okra I simply toss into a jar and let it be. Slice, quarter, or cut into spears, or leave whole (like with green beans, asparagus, okra etc). Bring the water, vinegar, salt and sugar to a boil in a small pot, and in the meantime pack the jars. Begin adding the veggies and if you are including the onion (which I recommend) , layer a few slices in with the veggies along with any fresh herbs you would like to include (you can also layer the garlic this way too, or put it in first, your choice) leaving about an inch at the top of the jar. Using your Homesteading funnel, ladle the hot liquid into the various jars, making sure to submerge all the veggies, pressing down on them with the end of a wooden spoon. You may be able to add more veggies at this point, just make sure the liquid completely covers the veggies leaving at least a half inch of room between the liquid and lid. Cover and let sit on the counter to cool, and after an hour or two, place in the fridge. These will taste good after 6-8 hours, but much better after a couple days. This keeps up to three weeks, so enjoy! There you have it, smart homesteaders! A pickled okra recipe where you can have a choice to make it crunchy, spicy, or extra savory depending on your preference. With this easy pickled okra recipe, you can experiment with other in-season veggies you want! Will you try to make this recipe on your homestead? Let us know in the comments below. This post was originally published on October 2016 and has been updated for quality and relevancy.